EAST LANSING, Mich. (AP) — Mark Dantonio had plenty of reasons for his frustration after Michigan State’s loss to Northwestern. Down by three in the latter half of the fourth quarter, the Spartans twice had the ball and went nowhere. Quarterback Brian Lewerke was under heavy pressure, and Michigan State couldn’t even make a first down. 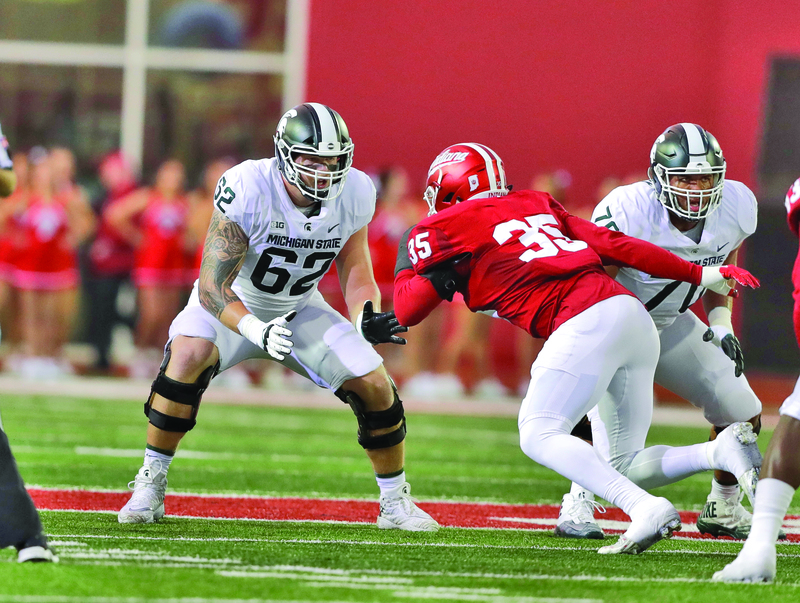 With tough games against Penn State and Michigan coming up, the Spartans don’t have much time to fix their leaky offensive line. Whatever chance Michigan State had to rally last weekend went by the wayside in large part because of poor pass protection, and what figured to be a solid line with four returning starters is now viewed — from the outside, at least — as a liability. Michigan State lost only one starter on offense from last season — center Brian Allen — but the offensive line hasn’t been at full strength. Junior tackle Cole Chewins missed this season’s opener and has played only 74 snaps in the four games since. Guard Kevin Jarvis has missed the past two games, and guard David Beedle — a fifth-year senior — went down early in the Northwestern game and is expected to be out for a month. The Spartans play at No. 8 Penn State on Saturday, and the Nittany Lions aren’t likely to have much sympathy for Michigan State’s injury woes. Dantonio has little choice but to coach whoever is healthy. Higby has started twice at center and three times at left tackle this season. Michigan State leads the nation in rushing defense, but the Spartans are 109th in rushing offense and have allowed 12 sacks in five games. Their inability to control the line of scrimmage was jarring toward the end of their loss to Northwestern. Down 22-19 with 6:41 remaining, the Spartans took over at their own 20-yard line. They lost 6 yards on a completed pass, and then Lewerke was sacked for a loss of 4. A holding penalty pushed them back 5 more yards, and they eventually had to punt. On Michigan State’s next possession, the Spartans stalled after a 9-yard gain on first down. Lewerke was nearly sacked on both second and third down, and after incompletions on those plays, the Spartans were stopped on fourth-and-1. Northwestern went on to win 29-19 . With Penn State coming up and Michigan on the horizon, any adjustments Michigan State can make would figure to come soon. But Dantonio isn’t wavering on his commitment to the running game. It’s hard to imagine an improved running game — or a consistent passing attack — without improved play from Michigan State’s offensive line. NOTES: Dantonio said P Jake Hartbarger’s lower leg injury from last month’s loss at Arizona State will likely end his season. The plan for now is for Hartbarger to get a medical redshirt and play again next year.